Something has to give, or your brain will collapse. Marketers have a lot tugging at their attention, especially social media marketers. You’re constantly having to check Twitter feeds, respond to comments, monitor customer engagement, and juggle a lot of projects at once because you often don’t have a huge budget for resources. 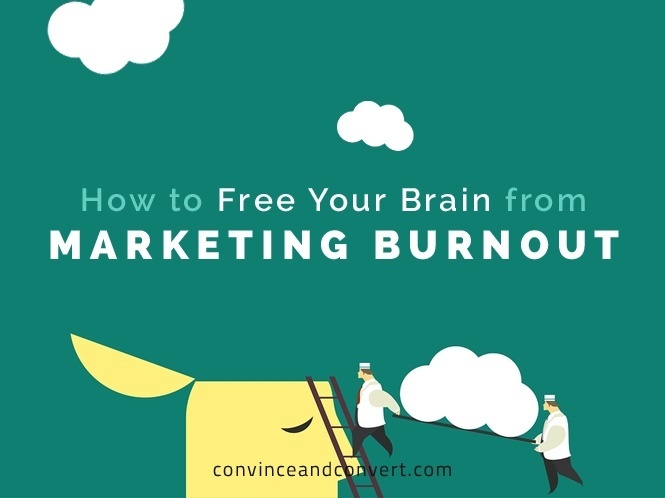 Here’s the reality: Your brain is going to become overwhelmed by the amount of things you’re requiring it to pay attention to, and the only resource you have paying attention to your business will be out of commission. Yikes! Being “always on” is both a faulty goal and a myth. Without reset, recharge, and the erasure of stressor hormones in your brain, eventually the thing that drives your genius will just lay down—right there in the middle of the room—and no one is going to wake it up until it gets the downtime it needs. Your brain needs you to pay attention to its needs. Then, and only then, will it pay attention to your client’s needs in a big way. Rested and managed well, your brain will get into heavy lifting that will outstrip the creativity and stamina of your comrades who are burning the midnight oil and letting every single electronic blip and bleep pelt their intelligence. So what does your brain need in order to give you that mental muscle? Here are a few facts about the brain that will help maximize your brilliance and stamina. Your brain will attend to what you tell it to attend to. If your attention is on one thing, it will provide you insights and innovation in spades. If you do not direct your brain to attend to one thing, it will try to attend to everything in the environment and do none of it particularly well. If you’re working on customer engagement for one client, stay with that until you’re finished before switching to another task. Your work will be more accurate, and you’ll statistically complete it more quickly in one sitting than in multiple attempts frustrated by interruptions. Focus. The adult brain needs a reset/recharge about every 50 minutes, with a few exceptions. Set an alarm that tells you to get up from your desk and re-hydrate your brain cells. Play a game for 10 minutes. Do something completely different. You will find yourself more productive for a longer period of time by doing this. When you look at distraction theory and what multi-tasking does to your work quality, you’ll see that you’re actually only getting about a quarter of the work done that you think you are. Plus, your IQ dips at least 10 points when you’re doing multiple tasks. The rule is this: One hour of focused time equals four hours of distracted time. And by distracted, I’m talking about both the interruptions throughout the day, as well as trying to do two things at once—multi-tasking. See the tip above. While we CAN do two things at a time, we shouldn’t. Multitasking is fine if you’re watching TV and putting stamps on envelopes—it doesn’t matter if the stamp is a little askew or upside down. But when you need accuracy, do only one thing at a time. When you do two things, your brain is literally quick-switching between the two things, cheating the quality of both. Attend to one thing at a time when it’s important to have high quality and high accuracy. The old adage that corporations and entrepreneurs held near and dear until, well, now, is that the way to be more productive is to do more with less. Nothing could be further from the truth—”doing more” completely flies in the face of our brain’s architecture. The new brain-friendly mantra is this: Do fewer things, so that you can do them better. Schedule at least two 50-minute focus times a day where you work on a project that is devoid of interruptions from phones and walk-in distractions. Go hide yourself somewhere. In order to be able to hide somewhere, pay attention to this next tip. This is the toughest but most profitable tactic. The solopreneurs among you may resist this. In order to truly be of service and to grow, look at a business model that forces you to become very honest about what you do extraordinarily well, and focus only on that. Then, find someone else who is brilliant at the other parts, and let them do that. 15 years ago, I went from flying solo to finding an awesome business partner. I took my advice from above. I took a dip in income for four years during the building of my “new” business. But soon I went from an OK income to being an INC. 5000 business. Altering your mental habits can be scary, but your brain and your business will love you for it. Scott Halford works with organizations worldwide helping them to maximize their potential by understanding their brain. His new book has just been released: Activate Your Brain – How Understanding Your Brain Can Improve Your Work and Your Life.